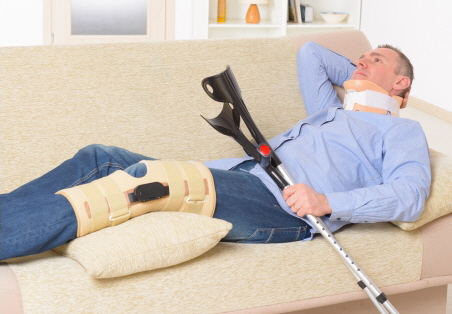 If you have had surgery for a broken knee, after you wake up your leg will be up on a pillow, to make sure it doesn't swell too much. You may have some numbness or tingling in your leg or foot but this will eventually go away. Your nurse will regularly check that the blood flow to your injured leg is all right. They will also check how much pain you are feeling and give you pain relief medicines, which your doctor will have prescribed. You must let your nurse or doctor know if your pain is getting worse even though you are taking pain relief. This can be a sign that the swelling in your leg is pressing on nerves and blood vessels (called compartment syndrome). This is a medical emergency and can cause permanent damage if it's not treated. A physiotherapist will see you and will try to get you moving as soon as possible. This helps to prevent the problems that can happen with long periods of bed rest. These can include blood clots in your leg (called deep vein thrombosis), infections, and muscle weakness. Before you leave, a physiotherapist and an occupational therapist will find out and arrange whatever help you might need. If you are worried in any way about going home, talk to a social worker and let them know. When you leave hospital you will get a follow-up appointment, a discharge letter that explains what has happened to you and your treatment plan, and a prescription and medication card if you need them. Make sure you follow the advice of your doctor and physiotherapist about exercises and how much weight you can put on your leg. If you don't follow this advice you knee may not heal, or may heal badly, causing continuing pain and other problems. If you smoke, stop smoking. Smoking affects how well your body can make new blood vessels, which reduces your chances of healing well. Make sure you keep your wound, and cast if you have one, clean, dry, and covered. Follow the instructions for any pain relief medicine you are given, and avoid any anti-inflammatory medicines, as they can slow down bone healing.